The founding member of an award-winning hip-hop dance troupe hangs up his sneakers to engineer a flying sports car. Tale as old as time, right? Yeah, not exactly. But it’s the path former dancer Kyxz Mendiola has carved out for himself. Six years ago, Mendiola decided he was sick of dealing with traffic, so he did what anyone in a similar situation would: started digging tunnels building a flying car. 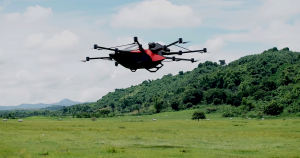 He calls the craft, which looks a lot like a giant remote controlled drone, the “Koncepto Millenya.” On Sunday he took it out for its first public test flight in the Philippine province of Batangas. It lasted about 10 minutes. Koncepto Milenya seats just one person weighing up to 100 kilograms (220 pounds). Its six lithium-ion batteries power 16 rotary motors, which allow the craft to reach a height of 6.1 meters (20 feet) and a top speed of 60 kph (37 mph). According to Mendiola, who co-founded the Philippine All Stars hip-hop dance group in 2005, flying the craft is pretty simple. Mendiola is working with Australian company Star8 to further develop the vehicle, with the goal of mass producing it. Star8’s CEO told Reuters he wants to market the flying sports car in Australia, Europe, and Hong Kong. No word on when Koncepto Milenya might come to the U.S., so traffic-averse Americans will just have to hope Elon Musk’s tunneling scheme works out. More on flying cars: How Close Are We Really to Flying Cars?